Compost tea making can be as complicated, or as simple, as you want it to be, but the bottom line is homemade compost tea will give you a stronger, healthier and more productive garden. Here's how to make compost tea. Garden compost tea is to your garden what a really powerful nutrient drink would be to you or me. It's a quick nutrient rush without having to do any work digesting it, and it means better health and better resistance to disease and insects. Just think of homemade compost tea as high powered juicing for your plants. Compost tea makers are way ahead of the game when it comes to self sufficient gardening. Compost tea making can be as complicated - or as simple - as you want to make it. The simplest way is to dump all kinds of organic material into a bucket, cover it with water and let it sit for several weeks. Eventually all the nutrients in the organic material will leech into the water and voila! You have garden compost tea. And while that is the simplest way to make compost tea, it is also the smelliest and will take the longest. Get a wooden paddle or rake and stir that tea on a regular basis, and you will help get oxygen into the mix, enabling the matter to break down much more quickly and eliminating the odor. This is known as steeped compost tea and works really well. So what is compost tea? It's organic matter and water that's allowed to sit for a few days to make the best, most natural fertilizer ever. Or, if you want to invest a little money and go more high tech, you can purchase a simple aquarium air pump and some tubing and pump oxygen into your compost tea. This is known as brewed compost tea. It's getting oxygen into your compost without your having to stir it. It also works really well without having to worry about stirring it on a regular basis or having an offensive odor the neighbors might complain about. 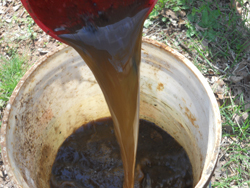 Making compost tea can be as complicated, or as simple, as you want to make it. You can make your tea in one of two ways. If you don't have any compost for your garden, and you want to add an organic fertilizer, you can take organic matter such as leaves and plants, put them in a 55-gallon barrel, add water and then stir it once a day for about two weeks. Don't cover the barrel, as you want lots of oxygen to get in. At the end of this time you have a great fertilizer that's ready to be added to your garden. Don't apply the tea directly to your plants. It's extremely strong and is likely to burn them. Instead, make a trench around each plant with a radius of about a foot from the plant. Then pour your steeped compost tea into the trench. That way, the tea goes right where the roots are and is less likely to burn your plants. Like everything else in life, the better quality you put in, the better quality you get out, and so it goes with compost tea making. 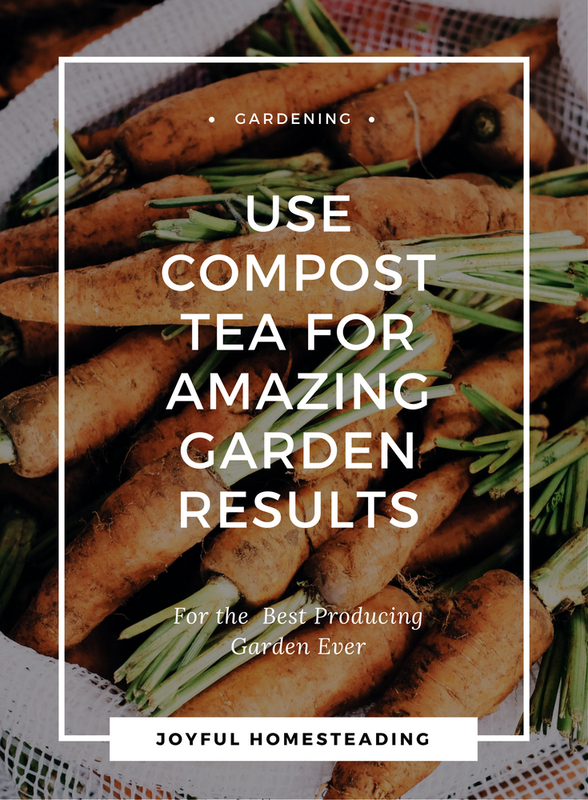 If you have ready-made compost on hand, you can make an even better-quality tea that you can spray directly onto the leaves of the plant, protecting it from disease and even healing your plants in some cases. Just add about two handfuls of cooked compost into a five gallon bucket, add water and let it steep for a few days. Again, don't cover the bucket. If insects get it, it's just more food for your plants. At the end of a few days, strain the tea by pouring it through a cloth to get only the liquid. 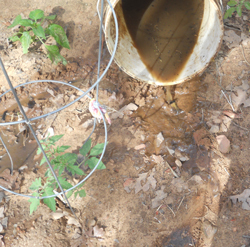 Put the solid matter back in your compost pile and use the liquid in your sprayer to add directly to the leaves. Your plants will absorb the nutrients instantly and turn into huge, healthy plants. Compost tea bags are helpful in compost tea making when you want a tea that will go in your spray bottle without clogging it with small particles of matter. Make a compost tea bag using a burlap bag, sock or old nylons. 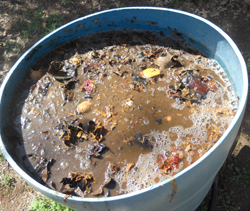 Fill the compost tea bag with cooked compost and allow it to steep for a few days. Then pull out the bag and dump the organic matter back into your compost pile. Put the tea in your spray bottle, and you're on your way to a healthy, productive garden that will feed you with the best nutrition possible and save you money.